that’s a great idea, melissa – bacon would go perfectly! Can’t wait to try it. I love brussel sprouts anyway. After I made Brussel sprouts that caused my husband and daughter to evacuate the house last summer I doubt they would happy to see me bring them home from the store again. The combo with maple syrup sounds divine. I’ll have to plan this for a day when I’m home alone. There was a disgruntled husband last night when I made this. It was better than the last time I made Brussel sprouts though. I diidn’t end up serving to the family though and ate it all myself before dinner was all ready. Delicious!! 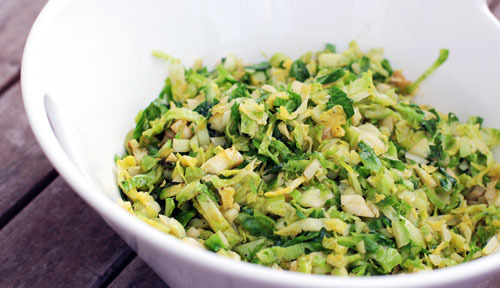 The thought of brussel sprouts usually makes me want to gag, but that looks super yummy. I might just have to give it a try. Since I had brussels sprouts in the fridge that needed to be used up I had to try this recipe right away. I tasted a little piece as they were cooking and really wasn’t sure I’d like them but they were so good! 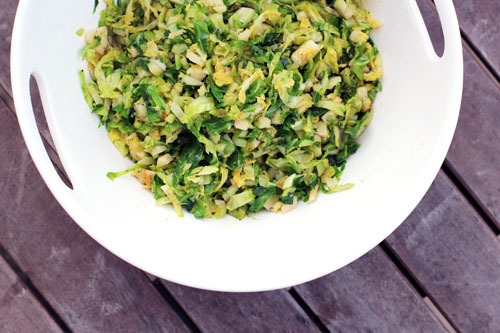 Thanks for a yummy new way to eat brussels sprouts! I REALLY wish I could get my hubby to eat Brussel Sprouts. Wonder if I could pull this off by adding bacon or a cheese sauce over the top. I love Brussel Sprouts. I had them raw for the first time last week. Sliced very thin (like in your post) and served as a salad with crispy panchetta, candied pecans and a mustard vinegrette. It was amazing. I think I found your link to the 60 second Brussels sprouts awhile back – loved it – and I used to be a Brussels sprouts hater. Will have to give this idea a try too. We also love to steam them – much better than boiling them. We love them so much, we are trying to grow them in our garden this year! And by we I mean me, my husband [who has always loved them] our 6 year old and our 4 year old. Our 4 month old will follow suit I am sure. looks like a lovely bastardization of the original recipe. These brussel sprouts look delicious! They are one of my favorite foods and luckily my whole family loves them. I’ll definitely try this preparation next time. Thanks for sharing. Remember the first time I had brussel sprouts was at one of my favorite restaurants in New York, Grange Halls. Sadly, now gone. The addition of maple syrup sounds delicious. Hey Jane! It’s 10pm, and my husband just requested these, so I whipped up a batch. A much healthier midnight snack than a bowl of ice cream! Thank you! 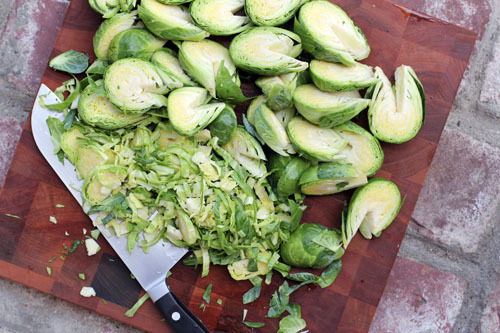 Now that is a really original way to make brussel sprouts. The cutting perhaps even more than the maple syrup. You can even get people who think they don’t like brussel sprouts to eat them without noticing what the are. Genius! it really is such a great way to prep them – and you’re right, it makes them much more palatable for the Brussels sprouts haters out there! so glad that my friend shared the tip with me- it is really great! Omg! These were really tasty. I made them tonight and have to admire how easy they were, less stinky than usual and just how delicious I found them.